A fast acting, cream bleach that will lighten hair so that it blends with your natural skin tones. It works in as little as 7 minutes without unpleasant smells. The creamy texture ensures no flaking or drying out during treatment. Enhanced with soothing Baby Oil and Vitamin E, it leaves the skin moisturised and soft. ­- Prior to using this product, always make a preliminary patch test to check for any allergic/sensitive reaction. ­- Simply mix a small amount of the product, as described in the directions and apply on a small patch of skin on the area where hair is to be lightened. ­- Leave it on for 7 minutes and wash the area with cold water. ­- Wait another 24 HOURS. ­- Do not use if redness, irritation, or eruption appears. ­- If the skin appears normal, use bleach as directed. ­- Over time, it is natural for the Accelerator Powder to clump together. Use the (clean) spatula to mix powder if this occurs. ­- Clean spatula and mixing tray thoroughly with soap and water when finished bleaching. ­- Do not return mixed ingredients to jar or vial. Always close both jar and vial after use; store in a cool place. ­- Do not use Nair Cream Hair Bleach immediately after a hot bath. Do not apply if skin has cuts or abrasions. Do not expose bleached area to sunlight for at least 24 hours after application. 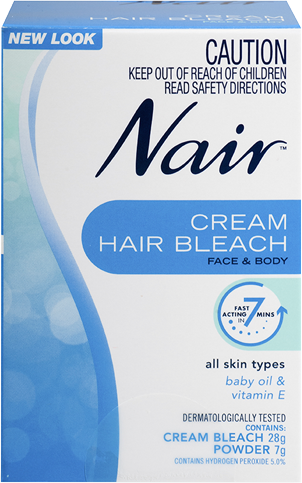 ­- Use caution to ensure that Nair Cream Hair Bleach, like any other product containing bleach, does not come in contact with clothing, upholstery or carpeting. Wash area to be bleached with soap and cold water; pat dry. To prepare mixture, using spatula, measure 1 full spatula of powder and pour into the mixing cup. Clean spatula. Measure 2 full spatulas of cream and add to mixing cup. (For larger areas, mix 1 part accelerator powder to 2 parts cream bleach on a glass or china plate). Blend powder and cream well with spatula. Apply mixture on the area to be bleached gently with spatula. Make sure you cover hair completely.DO NOT RUB IN. Leave mixture on for 7 MINUTES. Check hair after 7 minutes by removing a small section of bleach with spatula. If hair should require further lightening, reapply mixture to that section and leave on for another 5 minutes. Wash bleached area with cold water and pat dry. Clean spatula and mixing tray thoroughly with soap and water. 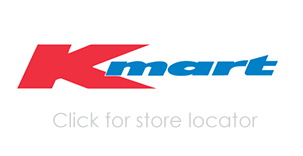 How long do I have to wait between applications of Nair™ products? We advise that you wait 72 hours between applications. Do Nair™ Hair Removal products have any effect on self-tanning products? Nair Hair Removers exfoliate skin in addition to removing hair, so using it before a self tanning product will help you to have a more even tan. Wait 24 hours between using Nair products and tanning. Can I sunbathe after using Nair™ products? No. It is advised that you wait at least 24 hours before heading out into the sun, please always use a sunscreen. How long do I need to wait before using Nair™ products after I shave? 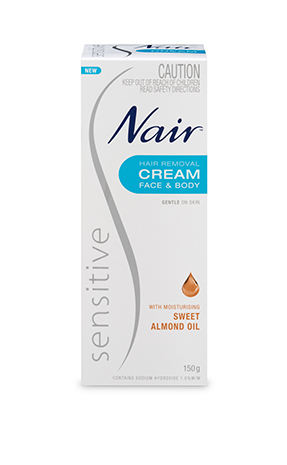 As a precaution, we advise not to use any Nair products on skin which has been shaved in the last 72 hours. 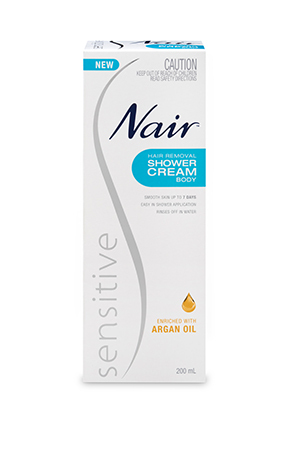 Can I use Nair™ products if I have sensitive skin? If you have no adverse or allergic reaction when testing the product as per the directions for use and precautions, there is no reason why you cannot use it. Conducting a small patch test will help. Should I do a patch test before each use – even when I have already used that same product successfully in the past? Yes, you should. The skin is very sensitive and can frequently change its composition with changes in your hormone levels. Since your skin is constantly in a state of change, we advise that it is necessary (not just desirable) to do a patch test each time to avoid any adverse reactions to the ingredients in our products. This is despite our rigorous dermatological testing process – as everyone’s skin is different, at different points. 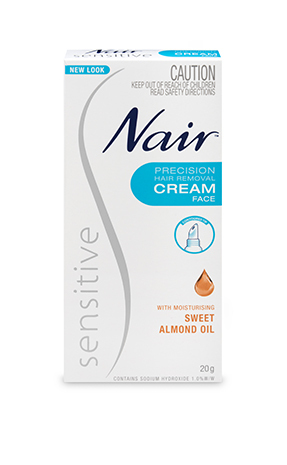 Nair Sensitive Precision Hair Removal Cream with moisturising Sweet Almond Oil, is specially formulated for the sensitive skin.